Individual Time Slot: best for one time events and events that don't happen on a set schedule. Repeating Time Slot: best for events that have a set recurrence schedule (i.e. Art class that happens at 10am on the first Friday of the month, or a private party that can be booked at 5pm every weekday). Series/Sessions Dates and Times: only available for the Series/Sessions listing type, and used to set a number of time slots that would all be purchased at the same time for each registration. 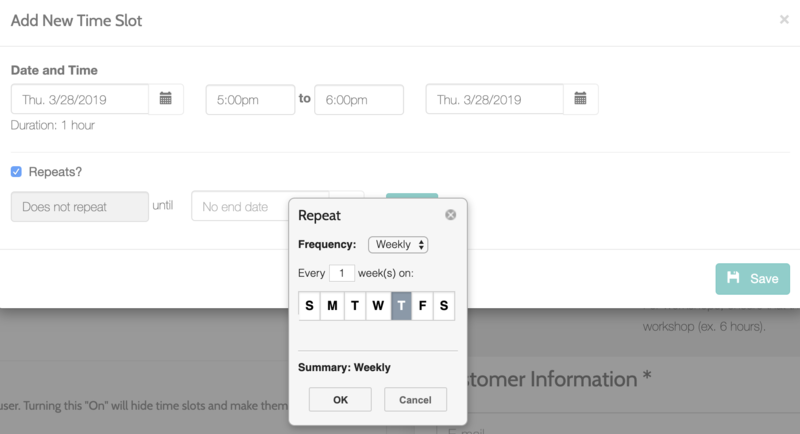 From the Calendars page, click on "Add Time Slot" near the top of the page and select the listing you'd like to add a time slot for. Select the start and end times for the event. Select the date of the next recurrence of this event. Select the start and end times for that date. Click on the "Repeats" box and set the recurrence schedule. Repeat steps 1-4 for any additional recurring time slots you'd like to add to this listing. From the "Dates and Times" tab choose the number of sessions that will be included in the registration and set the repeating schedule (i.e. Daily, Weekly on Mondays, etc). Select the date of the first session in the series. Select the start and end time for the first date. Click on "Generate Dates", and ensure that the dates and times generated are accurate.